I’m introducing a delicious, nutritious, healthy, and simple recipe today. Ow ow lots of adjectives, huh? 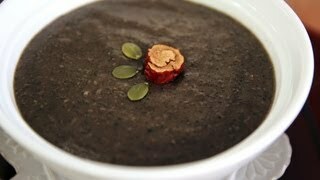 : ) It’s black sesame seeds porridge! Are you saying, “Uh oh! Warm porridge on hot day?” But this porridge is good for any season. It’s a very popular dish all year round. 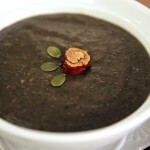 The black sesame seeds are a great source of healthy minerals. When you shop for sesame seeds, you’ll find 2 types: raw and toasted. I recommend using raw sesame seeds, and then you can toast them yourself using the instructions in my video. Your porridge will be more delicious this way. My friend said: “Yes, mother,” very politely. She thought toasting sesame seeds would be easy. She wanted to impress her mother-in-law, so she ran into the kitchen. She put the sesame seeds into a large pan. She figured she would need oil to stir fry, so she added a few drops of vegetable oil and kept stirring. A long time ago in Korea, sesame seeds were always mixed with a little sand or small stones, so we had to wash and drain them many times to get rid of the grit. Put the black sesame seeds into a strainer and scrub them under running water. Drain the seeds and put them in a thick bottomed pan or pot. Stir with a wooden spoon over medium high heat for a few minutes. When the sesame seeds start popping, lower the heat. Keep stirring until they’re crispy. Blend the toasted black sesame seeds with ½ cup of water for 1 minute until the mixture is smooth. Add 1 cup of water to the mix and blend it again for another minute. Put 3 tbs of sweet rice flour into a thick bottomed pot. Mix in the sesame mixture with a wooden spoon. Bring to a boil. Keep stirring over medium high heat for about 2 to 3 minutes until it bubbles. Lower the heat to a simmer. Keep stirring for 3 to 5 minutes. The porridge will thin out a little and become shiny. Add ½ ts salt and mix it well. Transfer to a serving bowl. Garnish with a jujube and pumpkin seeds (or pine nuts) and serve warm. Posted on Thursday, July 19th, 2012 at 3:38 pm. Last updated on October 5, 2014. Posted June 18th, 2017 at 12:18 am | Log in to reply. Can I use black sesame powder in replacement for the black sesame seed? Posted November 9th, 2015 at 8:14 pm | Log in to reply. Hi! I have a question! I’m going to be having throat surgery soon and was wondering if I could make this porridge in advance and keep it in the fridge so I can eat it at room temperature as I am recovering. This question also goes for the butternut squash and pine nut porridges. P.S- I love all your recipes! Posted October 27th, 2013 at 12:00 am | Log in to reply. My dog, Zulu, is very sick. He just came home from ER for five days for kidney failure…he almost died. Now he is home and is trying to recover from his kidney disease so he can live much longer. I made this Heukimjajuk today and he ate very well. Literally, I made Juk and gave it to a dog (Old Korean saying). Thank you so much!!! When he’s done with this Juk I’m going to make pine nut Juk for him. Your Juk recipes are awesome!!! Posted October 27th, 2013 at 11:51 am | Log in to reply. Your love for your dog makes me feel warm. I hope Zulu recovers quickly! Posted October 27th, 2013 at 5:11 pm | Log in to reply. Posted May 4th, 2013 at 3:50 pm | Log in to reply. Hi Maangchi! Thank you very much for your recipe. My sesame porridge comes out very smooth and tasty. I like it so much that I’m going to make it again today. Thanks a lot. You make my day brighter. This recipe was originally posted on July 19, 2012 at 3:38 pm by Maangchi. It was last updated on October 5, 2014. The video was watched 205,208 times on YouTube & has 2,224 likes! See the Wikipedia entry on this dish.